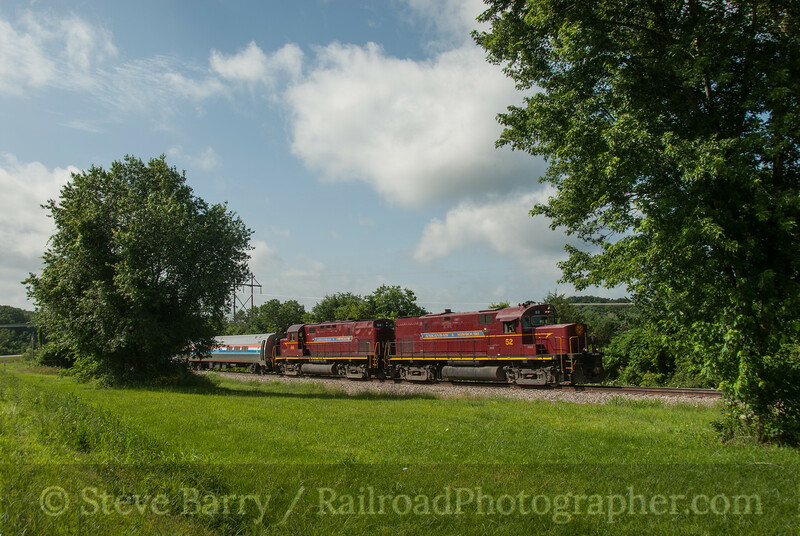 We're working our way through photos taken on a two-week trip circling the upper Midwest (and beyond) in conjunction with the 2014 convention of the National Railway Historical Society. 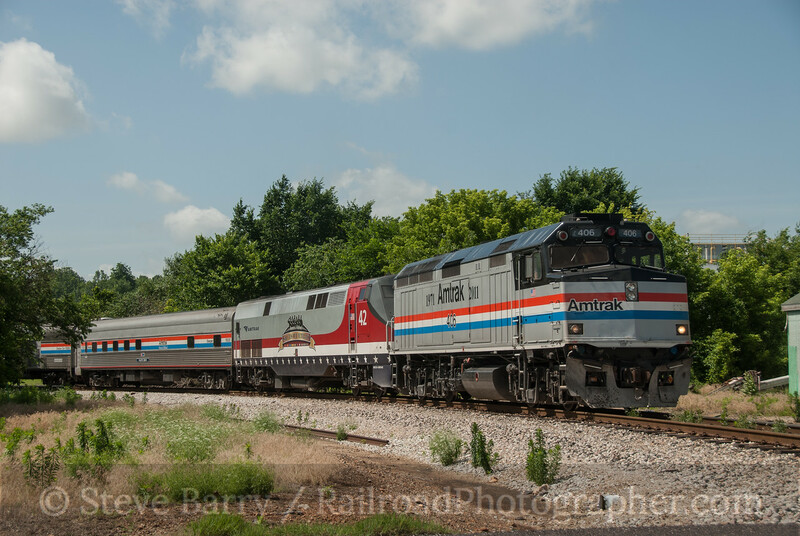 So far we have ridden a photo freight charter with NRHS and visited some tourist railroads in the Ozarks. 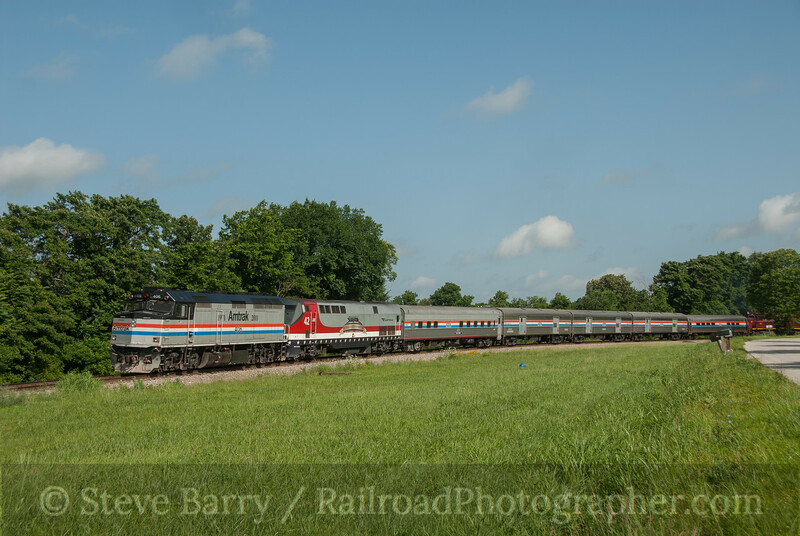 As part of the convention, Amtrak sent its display train (originally the 40th Anniversary Train for the birthday in 2011) to Springdale, Ark. 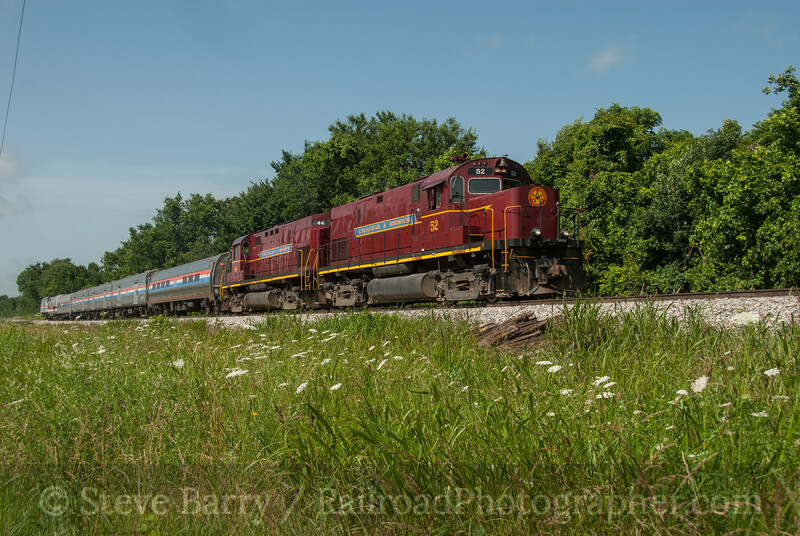 Once the convention was over, the train departed Springdale to head to interchange with BNSF Railway in Monett, Mo., over the Arkansas & Missouri. 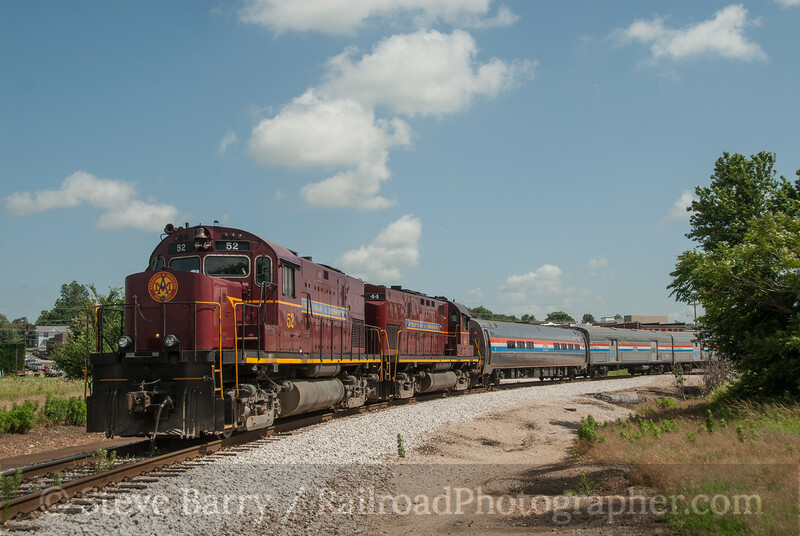 And what better way to get the train over the railroad than behind two of A&M's classic Alco locomotives! The train was parked in the shop area of the A&M with the rear of the train right up against the south doors of one of the buildings. The first order of business was to send two of the railroad's C420s into the north end of the building to couple onto the rear of the display train. On the south end was C420 No. 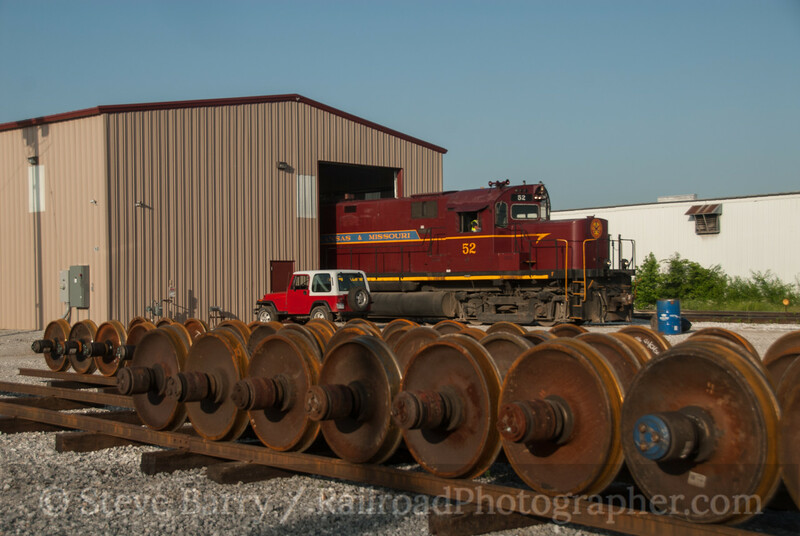 44, built by the American Locomotive Company in May 1965 for the Louisville & Nashville. On the north end (and leading the train) would be No. 52, built by Alco in December 1965 for the Lehigh & Hudson River. No. 52 pushed back into the shop to couple up. Getting out ahead of the road freight to Monett, Mo., (appropriately known as the "Monett Turn"), the train raced through downtown Rogers. ... the going away view was the "money" shot as it showed the entire Amtrak train on the curve leading into downtown. On the rear of the train was NPCU (Non-Power Control Unit) No. 406; this was originally an F40PHR but has had its prime mover removed, making it an unpowered cab car. Between No. 406 and the train was P42DC No. 42, painted in a special U.S. Veterans commemorative scheme by Amtrak. North of Seligman the train passed some nice white flowers (top photo of this post). Since the train needed to be pointing east for BNSF Railway, it paused south of Butterfield to turn on the wye. This put No. 406 on the point as it headed through the feed mill north of Butterfield. Since No. 406 has no engine, No. 42 was doing all the work. Finally the train arrived at the BNSF yard in Monett. 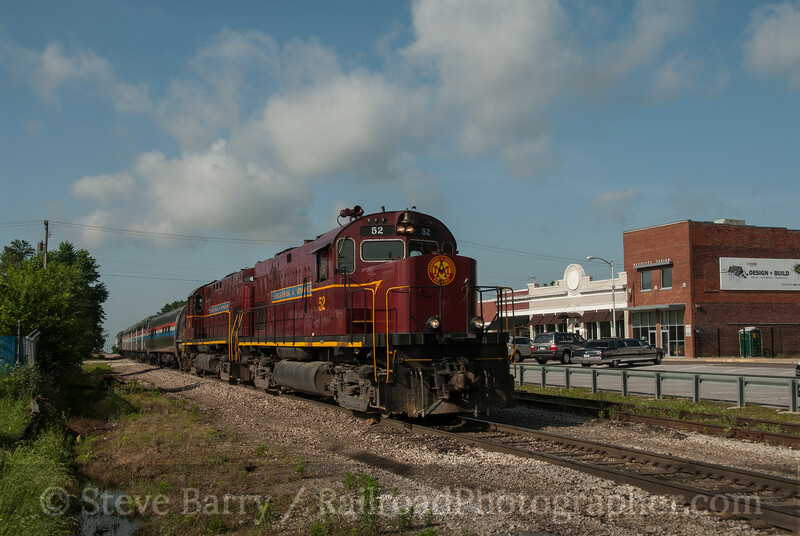 The A&M makes a sharp turn as it enters the yard. At this point the Alcos were only along for the ride. Once in the yard they would uncouple from the Amtrak consist and await the following Monett Turn to pick them up and take them back to Springdale. 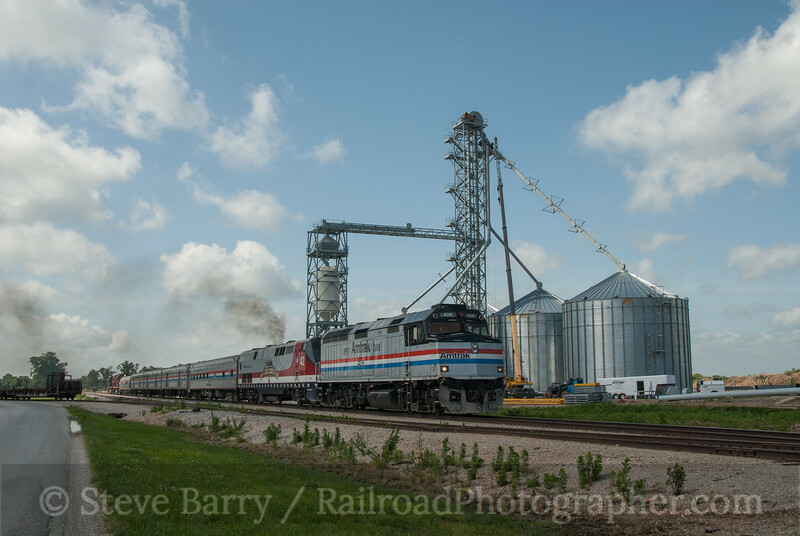 A BNSF crew would board the Amtrak consist and ferry it towards Chicago on the next leg of its journey that would ultimately see it next displayed in Harrington, Del. More photos of this move can be found here.